3.3 PARC Document Delivery questions? Even in a digital age, UBC Library’s physical collections grow and require a long-term strategy for storage, access and preservation. North American research libraries have used high-density storage facilities for many years to address these needs. UBC Library is fortunate to have two such facilities: ASRS and PARC. In 2005, the Library opened the Automated Storage and Retrieval System (ASRS), its robotic storage facility in the Irving K. Barber Learning Centre. In the following decade, the Library's physical collections continued to grow, and with it our need for space to house them. In 2015 we opened a new storage facility, Library Preservation and Archives (PARC). UBC Library was the first in Canada to use this technology to provide fast, easy and effective storage and retrieval. The system operates in a secure, climate-controlled setting, providing an optimal environment for the preservation of print and other materials. With a capacity of 1.8 million volumes, the ASRS is located inside the Irving K. Barber Learning Centre at 1961 East Mall. Library Preservation and Archives, aka Library PARC, is a new modular storage facility built to accommodate the future growth of collections at UBC Library. Located at UBC Vancouver’s South Campus (in the Research Precinct), PARC provides 2,280 square metres of high-density collection storage and can house about 1.6 million volumes. The facility also houses the University's Records Management Office, a staff work area and a publicly accessible reading room. Low-circulation items from the Library’s collections will be relocated to Library PARC, freeing up physical space at branches for other uses, including student and research services, study spaces and informal learning areas, multimedia labs, scholarly exchanges and more. 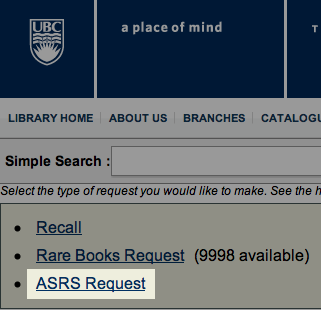 Requests for material to be retrieved from the ASRS can be submitted using the Library’s online catalogue. Items can be picked up at any Library branch, BC Children's & Women's Hospital and Robson Square. If you want to request items in Rare Books & Special Collections or University Archives, please speak to a staff member there. They must place the request for you. Rare Books & Special Collections and University Archives materials can only be used in the branch reading room. Rare Books & Special Collections and University Archives materials will not be delivered to other Library branches. Items from a "branch use only" location will not be delivered to BC Children's & Women's Hospital or Robson Square. Items will be available at the I.K. Barber Library circulation desk within 30 minutes and at all other Library locations within 1 to 3 business days. Items sent to Robson Square can take up to 7 business days. You will receive an email informing you that your item is available for pickup. It will remain at your pickup location for 4 days. Materials held in ASRS can be found in the Library’s online catalogue. I.K. BARBER LIBRARY ASRS storage – These materials can be signed out and renewed. I.K. BARBER LIBRARY ASRS storage (branch use only) – These materials can only be used in the Library branch and must be returned by the end of the business day. Items from this location will not be delivered to BC Children's & Women's Hospital or Robson Square. XWI7XWA ASRS storage – These materials can be signed out and renewed. XWI7XWA ASRS storage (branch use only) – These materials can only be used in the Library branch and must be returned by the end of the business day. Items from this location will not be delivered to BC Children's & Women's Hospital or Robson Square. If the status of the item is Available, you may place an online request. Click on the Request this item: Recall/ASRS link in the “Actions” box on the right-hand side of the screen. 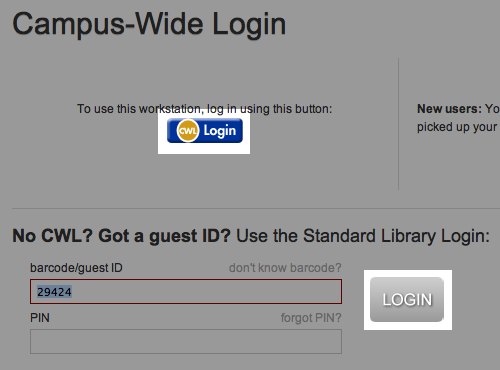 On the next screen, you need to login to the Library Catalogue using either your CWL or UBC/Library barcode and PIN. If you do not have a library card, please speak with a staff member at the Circulation Desk of the I. K. Barber Learning Centre. After you have logged in, select ASRS Request from the list of available links to place an ASRS request. Next, select your pickup location from the list. 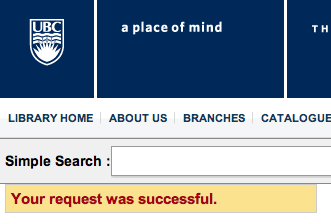 This message indicates that your request was successful. 1. Materials held in PARC can be found in the Library’s online catalogue. PARC (branch use only) – Can be shipped to any Library branch except Robson Square and BCCW Study and Learning Commons. These materials can only be used in the Library branch and must be returned by the end of the business day. PARC (circulating) – Can be shipped to any Library branch. These materials can be signed out and renewed. XWI7XWA PARC (branch use only) - Can be shipped to any Library branch except Robson Square and BCCW Study and Learning Commons. These materials can only be used in the Library branch and must be returned by the end of the business day. XWI7XWA PARC (circulating) - Can be shipped to any Library branch. These materials can be signed out and renewed. 2. 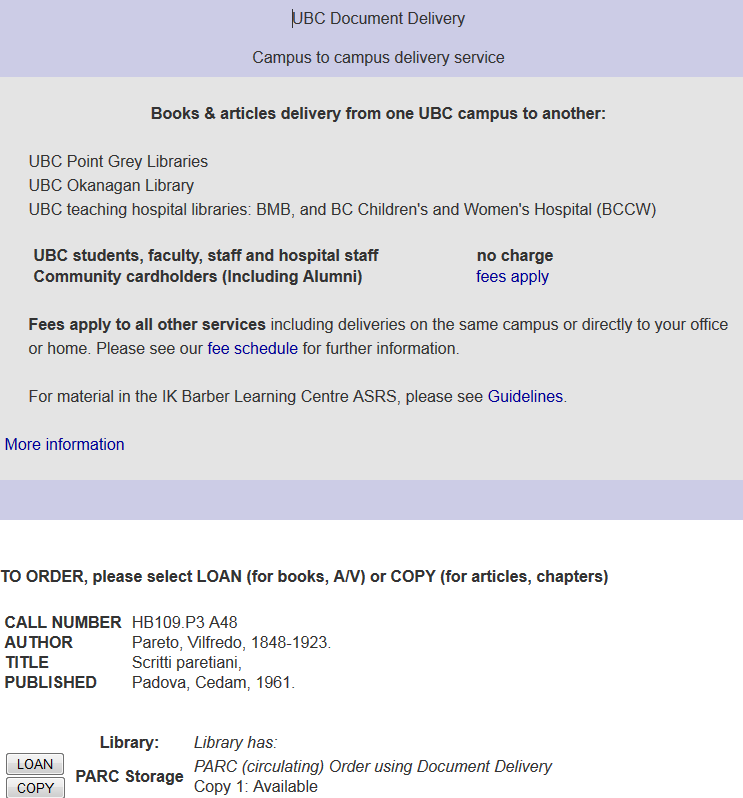 To obtain material from PARC, UBC Library cardholders will use the Document Delivery system. 3. Materials requested before 11:00 am and shipped to UBC Vancouver locations and will normally be available for pickup within two business days. 4. Materials shipped to UBC Okanagan will normally be available for pickup within three business days. 5. You will receive an email with the material is available for pickup. Can request PARC materials by going to the following branches: Koerner, IKBLC, Woodward or Okanagan. Materials can only be picked up and used at one of these branches. They cannot be removed from the branch. Materials will be available for use within 2-3 working days after the request is placed, if placed before 11 am. 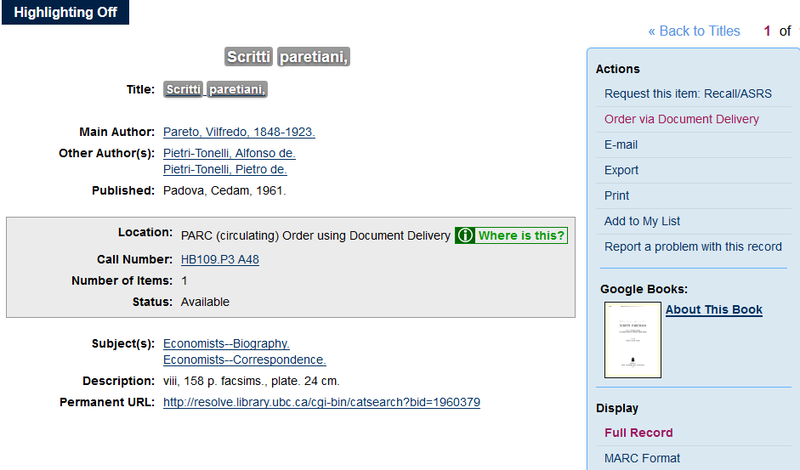 Can order materials from PARC via interlibrary loan from their local public library. a. Search the Library ‘s catalog. b. Display the full record. c . Click on Order via Document Delivery. d. Choose either Loan or Copy (i.e photocopy of chapter) for a book or Copy for a journal. 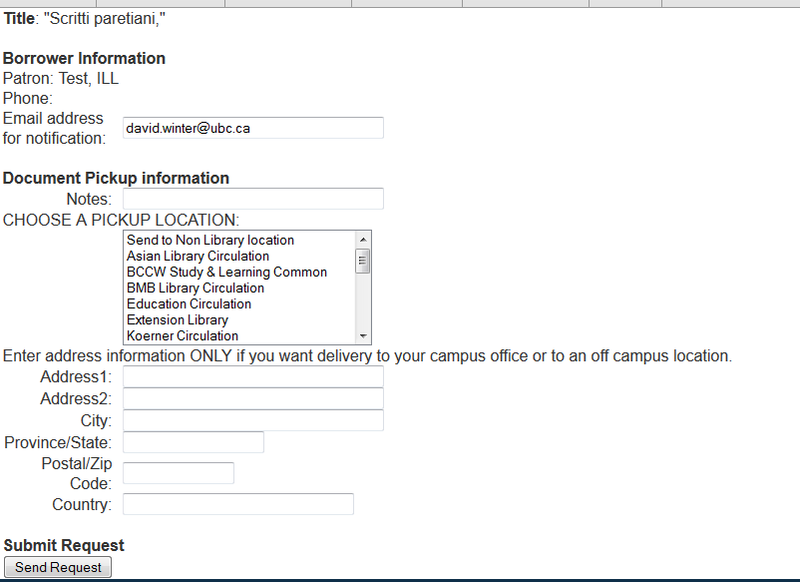 If you need the entire volume of a journal, please add a note in the Document Delivery order form note field. f. Complete the order form. i. When the item arrives at the pickup location, you will receive an email messaging saying that the item is available for pickup. If the item can not be located at PARC, PARC staff will inform Document Delivery that the item is MISSING, and Document Delivery will, in turn, let you know that the item is not available. If you are having difficulties with receiving an item from PARC, please, contact Document Delivery, and they will help find an answer for you. Please do not contact PARC if an item is late to appear, because your requests are being tracked by the Document Delivery system. This page was last edited on 18 January 2019, at 19:40.